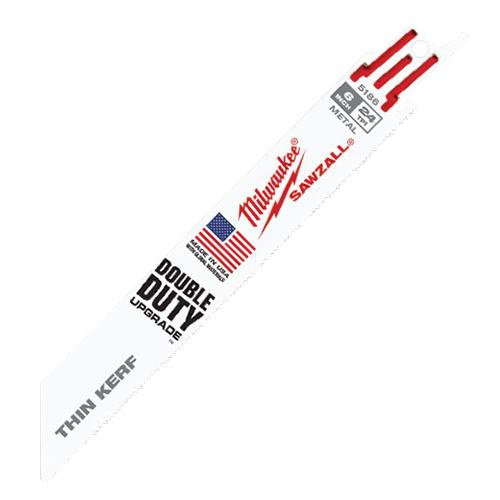 Milwaukee Tool Double Duty Upgrade™ The Torch™ Sawzall® Straight back reciprocating saw blade is suitable for cutting wood with nails. Blade with 1/2-Inch universal shank, features bimetal with cobalt construction. It measures 9-Inch x 3/4-Inch x 0.035-Inch. This thin kerf blade has 18 TPI for faster cuts. It has thicker and more rigid body that resists fracturing and bending for maximum durability. This 1-Inch tall blade body reduces blade twisting for straighter and more accurate cuts.